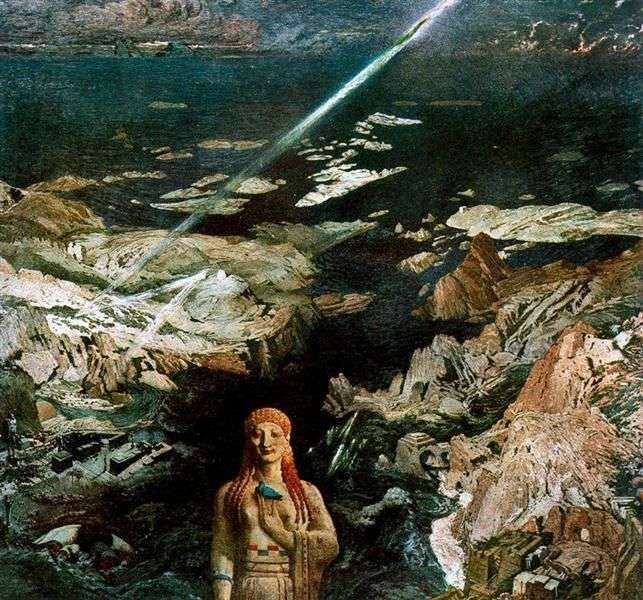 To write the painting “Ancient horror”, Leo Bakst visited Greece several times. Every time he visited this country with an ancient history, he brought out a new idea for his future masterpiece. Since the art of Greece has been developing continuously from time immemorial, on the canvas of Leon Bakst, regardless of the time frame, the cultural monuments of ancient Aegean culture coexist peacefully, and the works of art of Classical Greece. The central composition object was the statue of the goddess Aphrodite holding a pigeon in her hand. Behind her, you see a catastrophe that takes some civilization into oblivion. What did the artist want to tell the world about this picture? The work was conceived during the first Russian revolution of 1905, when people, accustomed to a monotonous, measured life, came across many new phenomena and concepts. Perhaps the artist wanted to show the inevitability of the destruction of the old way of life for acquiring new ideals and goals? The fate of the painting “Ancient horror” confirmed her masterpiece: in 1909 she was exhibited in Paris, next she gets a gold medal at an exhibition in Brussels. And for Leo Bakst herself she turned out to be a turning point – many times he tried to write something like that, but each time his plans were not realized, now he created only scenery for the plays. In addition, the painting “Ancient horror” marked the beginning of a new direction in painting – neoclassicism, very painfully met by critics of the time. Description and meaning of the painting Ancient horror by Leon Bakst.